The original instrument for this sample set is a precious historical Positiv from the early 18th century, presumably built in Southern Germany. Except for the addition of an electrical wind supply (Ventola), which can be used instead of the fully functional wind supply with a foot-pumped bellows, it is in original condition and exceptionally well maintained. The instrument is ideally suited to accompany small choirs or instrument ensembles. It is part of a private collection of historical musical instruments located in Braunschweig (Germany). The instrument comprises one manual (C-c'''') and four stops: Flute 8'' and 4'', Voxumana 2'' (a labial stop!) and Principal 1''. The 1''-stop has been added later to the original instrument and can only be played together with the Flute 8''. You can download the booklet (pdf) included with the sample set here. The Positiv has been recorded in Dezember 2015 with high quality microfones using a Jecklin disc in a studio-like room with very little reverb. Each pipe has been recorded with two separate release layers, one for staccato and one for longer notes. A third release layer does not add anything with the short reverberation time of the room. Blower and action noise have been recorded separately as well. Due to the very dry recording the set is exceptionally well suited to be used in rooms with strong reverbaration or for adding reverb by post-processing. 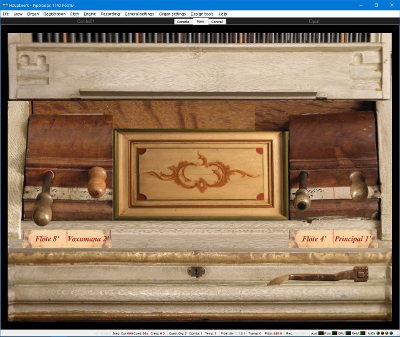 The volume of the blower and action noises can be adjusted with sliders in the graphical user interface. As a special addition reverb samples have been created from the dry recordings. This gives the user the option to add reverb to the sound. Two virtual rooms are available, one with about 1.5 seconds reverb and the other with 3-4 seconds. 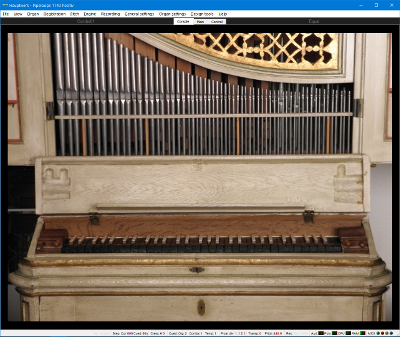 These can be selected using a switch on the organ image, and the reverb intensity can be adjusted in real-time using a slider. This new feature is unique and gives users more options to adjust the sound of the Positiv to their taste. Another unique feature of this set is the detailled modelling of the wind supply using a manually pumped bellows, allowing a historically correct performance with a breathing instrument. In the original instrument the bellows is operated with a foot pedal at the right side of the organ case. Pushing down the pedal lifts the upper plate of the bellows, upon release of the pedal the weight on the bellows forces it down again pressing air into the reservoir bellows. After about 4-5 strokes the reservoir is filled and an overflow valve opens to release the extra air with a noticeable hiss. The winding system is designed with considerable leakage so that the reservoir will empty itself in a short time even when no pipes are speaking at all. This leakage has two advantages. On one hand it makes it easier to play with a consistent pumping motion, on the other hand it reduces the pressure peaks when pipes start or stop speaking, as the heavy reservoir bellows plate is kept in a nearly constant motion. This manually operated wind supply has been completely modelled in the sample set, a truly funique feature among Hauptwerk sample sets! 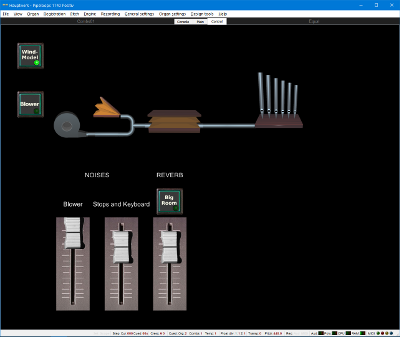 The best way to operate the bellows is to use Hauptwerk's MIDI-Learn feature to connect the organ's expression pedal (if available) with the foot pump lever. Then pushing down the pedal will fill the pumping bellows with air, and lifting it up again will make the air flow into the reservoir. With a little practice one can then control the wind and the resulting sound fluctuations matching the rythm of the music one is playing. The "Control"-page of the GUI visualizes the operation of the wind system and the air level in the reservoir. This sample set requires a Windows-PC or Apple Mac-OS computer and the Hauptwerk™ software, Advanced Edition, Version 4.2 (The Free or Basic Editions will work as well except for the wind modell, which does require the Advanced Edition). CPU and memory requirements are quite low, the required sample memory is about 860 MB (16-bit compressed) or 1720 MB (24-bit compressed) when loading with 24bit resolution. §1) This agreement defines the licencing agreement between Pipeloops Reiner Suikat and the user of the sample set of the historical Positiv organ. The sample set consists of the samples, images, database, and other files. A fully functional trial version of this sample set can be downloaded from us. The trial version contains all samples and functions of the licenced sample set, but the sound is muted periodically when playing. You can download this trial version here.